Cape Cod’s winter woods possess a rough, remarkable beauty. Pale sage-colored fruticose lichen, wispy and delicate, softens bare oak branches angled against the cold white sky. Other lichen of the crustose variety, look sponge-painted in splotchy hues of vibrant ochre on rocks that jut out of the leaf litter. Here and there white pi nes, rich with green needles, fight for purchase in a forest increasingly dominated by white, black, and red oaks. 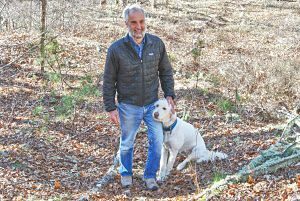 “I love it out here,” says Patrick Otton as he walks the woods of his house lot that is next to the undulating 49 acres of open space recently protected by Harwich Conservation Trust (HCT). Otton was one of many people who helped preserve the land. His contribution, about which he is modest, was a unique one. When it looked as though the remaining funds necessary to preserve the land might not be raised, Otton offered his house and land which abut the 49 acres, as motivation to potential contributors. His offer added both value and acreage to the preservation effort. For his dog, Sky, all this is beside the point as he pauses to nose through a blanket of leaves at the base of a scrub pine and tries to pick up the scent of who or what may have passed before him. Sky happily resumes his purposeful trot amongst the trees with Otton in tow. “Doesn’t he just look happy,” Otton says of the Sky. The dog does look happy as does Otton. After two years of puttering away restoring his cottage, Otton “officially” moved into the home situated on an acre of land on Kendrick Road in East Harwich. The house was sold as a “tear down,” he says, quickly noting that “tear down just isn’t his style.” He’s been renovating the place himself, using as much from the original structure as he can. 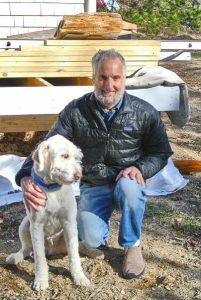 In addition to his passion for the out-of-doors and nature, Otton’s other great love is abundantly clear around the house: boats, big and small, fill his yard. And so, Otton got a degree in electrical engineering and for years worked designing industrial controls. He admits with a laugh, he lived two lives: one in the official workplace, the other as woodworker whose favorite projects involved messing around with boats. 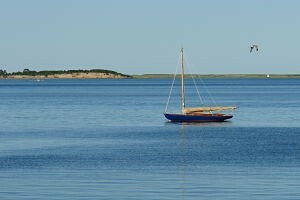 Otton says he reached a point where he knew he didn’t want a life where boats were always on the back burner, so he moved from the Boston area to the Cape. Here his first job was with Arey’s Pond Boatyard. Now he works at Karl’s Boats in Harwich. He’s an avid sailor and kayaker, and also helps coach Nauset High School’s rowing team. When Otton purchased his tear-down and land, HCT’s “Pleasant Bay Challenge” to preserve the 49-acre landscape was underway. This parcel was the largest piece of undeveloped, unprotected land in the four-town, 21,000-acre Pleasant Bay Watershed. The focus of conservation and preservation efforts for decades, Pleasant Bay and its surrounding watershed were designated an Area of Critical Environmental Concern by the state in 1989. For years, the 49-acre parcel topped the most wanted list for the Harwich Conservation Trust. Finally, and coincidentally during HCT’s 25th Anniversary Year in 2013, the stars aligned to launch a two-year fundraising goal of $3.6 million in order to purchase and preserve the land. HCT partnered with two anonymous families, two foundations, the Wequasset Resort and the Friends of Pleasant Bay to create the Pleasant Bay Challenge of $1.8 million to attract another $1.8 million from the community in matching funds with hopes of reaching the $3.6 million goal. Over the following months, many did indeed contribute matching funds, and yet as the deadline loomed in August 2014, a shortfall of $500,000 remained. Otton notes, there was a definite sense of urgency to preserve the land that could help protect water resources. HCT Executive Director Michael Lach agrees. With the majestic power of the Atlantic drawing our attention out toward the sea, it is, at times, easy to forget the forest. The diverse habitats are used by resident and migratory wildlife for foraging, nesting, and sheltering. The habitat edge between the wooded uplands and wetlands attracts a variety of bird species. The land hosts vernal pools that harbor sensitive species which are otherwise unable to survive. 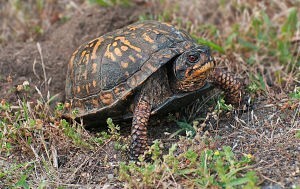 The Eastern box turtle, a Species of Special Concern in Massachusetts, has been observed in the vicinity. As the clock ticked on summer fundraising efforts, Otton said he wanted to help in some way. He decided to offer up his new home and land, which abuts the 49 acres. “Patrick’s contribution was unique in that he inspired land-saving support for the 49-acres through planned giving,” Lach said. Otton has a reserved life estate, which means he will continue to live in his home until he passes away, at which point HCT will receive his gift of woodsy land and home. Patrick’s forward-thinking gift of land and home to HCT has become part of a new initiative started by HCT, called “Homes for Habitat.” For some folks, giving their home to HCT makes sense either as a gift during their lifetime, through a bequest in their will, or in Patrick’s case through a reserved life estate. By gifting your house, you enable HCT to: raise funds by leasing, raise funds by selling, provide housing for HCT staff/interns, or someday restore natural habitat by removing the house. When HCT fully receives Patrick’s house gift, HCT will have the option of leasing the house, providing housing for HCT staff/interns that could be a steward of the neighboring 49 acres, or restoring the land. Flexibility is the key to this new and innovative way of making a land-saving difference.